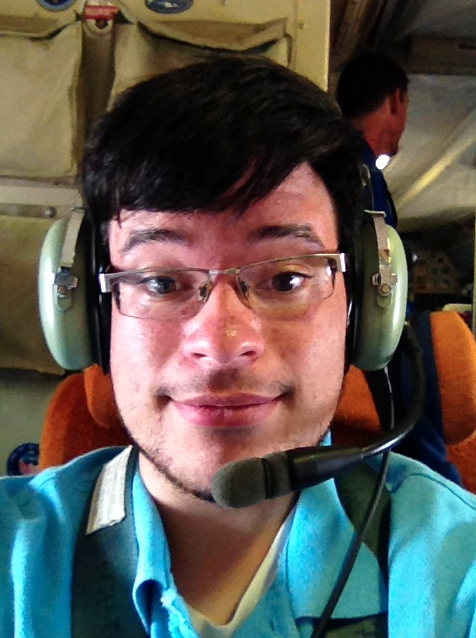 Interview with rookie hurricane hunter Joseph Patton. The NOAA hurricane hunters, a team of Florida-based airborne scientists, collect crucial weather data that help calibrate computer models and improve forecasts. And this week, they’ve temporarily relocated this week to the Pacific. It’s not the first time Hurricane Hunters have flown out of Hawaii, but it’s a rarity. On Thursday, Hurricane Iselle will become the strongest tropical system ever recorded to make landfall on the Big Island of Hawaii. Last month, Hurricane Arthur became the earliest landfalling hurricane in North Carolina history. With so much record-breaking weather, there are a lot of questions to be answered. 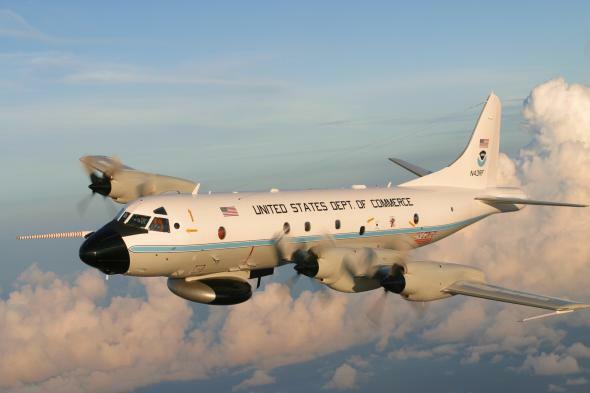 The National Oceanic and Atmospheric Administration hurricane hunters’ primary mission is science, in contrast to the Air Force hurricane hunters, who’ve flown missions since 1944 aimed primarily at tracking storms for public safety. After he landed, we spoke briefly about his experience. So, how’d you become a hurricane hunter? I’m a meteorology student at the University of Oklahoma, going to be a senior in the fall. This summer, I am an intern at the Hurricane Research Division of NOAA, so as part of my internship, they let me fly on the planes. It’s pretty cool. Note: Patton’s internship has since ended, so he didn’t get a free trip to Hawaii this week. How was the flight? Did you puke? Thankfully NOAA has a large supply of puke bags onboard. I had one, but I didn’t have to use it. Some other people weren’t so lucky. The plane comes fitted with three radars. * One in the nose, to make sure they don’t run anything, and the other two are for gathering scientific data. The first flight actually was much bumpier than the second one, probably because the storm was still forming and there wasn’t an eye yet. It’s interesting because you don’t expect the weaker storm to have the bumpier flight. What’s the worst-case scenario up there? I mean, remember, you’re flying a plane through a hurricane. Sometimes they have such bad turbulence that they have to abort and kind of limp home with whatever remains of the plane. Back in 2007 with Hurricane Felix, which was a Category 4 or 5 at the time, one of the planes pulled the equivalent of 7 G’s for a few minutes. The plane is only rated to withstand 2 G’s. We actually ran into a problem ourselves with our second flight. Everything was going pretty smoothly, but we had some fumes in the cockpit, so the pilots decided to abort the rest of the mission and head back to Tampa. The most G’s we had was about .6 on that flight. So, are you strapped in for most of the flight? Patton: Normally for the eyewall penetrations, the pilot puts on a little “fasten seat belts” sign, just like in a regular plane. But most of the time you’re allowed to move about. Our seat belts aren’t just your normal over-the-lap kind, either—it’s a shoulder strap with a complicated latch. There’s usually about 15 or 20 science staff in the main part of the plane, so it takes us a while to get all secured. Could you tell when you flew through the eye? Patton: You could definitely tell. You could see down to the sea surface out the window. But we were flying relatively close to the water, so you didn’t have that great of a perspective. For us it was a lot of clouds, and then “oh, there’s the eye,” and then a lot more clouds. Do you think a drone could ever replace you guys? My guess is it would be hard to have the intuition about what’s safe and what’s not safe to fly through if there was no one on board. If you have scientists up there, you can say in real time, “Oh, this looks good, we should do this.” There’s a lot of real-time scientific analysis that goes on. Plus, we have a lot of machinery up there, too, to help us make our measurements. A drone can’t hold all that equipment. This conversation has been lightly edited and condensed. Onboard, Patton took a selfie. Correction, Aug. 8, 2014: This post originally quoted Joseph Patton as saying NOAA hurricane hunter planes have three Doppler radars. Only one of the three radars have Doppler capabilities. It also quoted Patton as saying the U.S. has never lost a hurricane hunter air craft. Six planes have been lost. The original quotes have been removed.